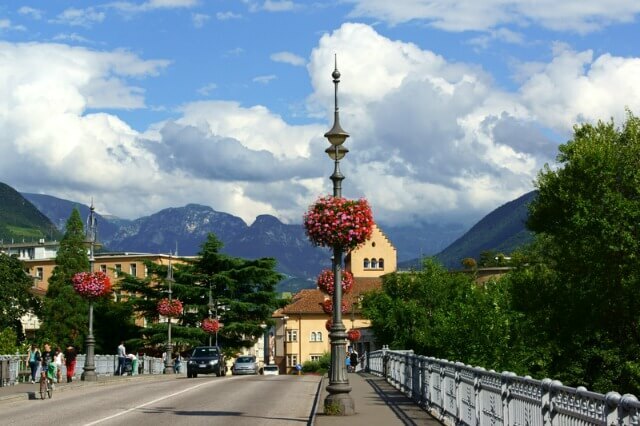 The mostly German speaking city of Bolzano (Italian), or Bozen (German) as it is more commonly called by the locals, is nestled within the glorious mountain backdrop of northern Italy. Flanked by the dramatic Dolomites and the vineyards and woodlands of verdant South Tyrol, it’s often recognised as the ‘capital of the Alps’, making it a firm favourite with hikers and mountain walkers throughout the world. A particularly popular location for hiking is the nearby Salten Plateau, an area close to the neighbouring town of Jenesien; which is only 10 kilometres (6.2 miles) from the city. Situated on the southern side of Mt. Tschögglberg, it benefits from around 300 sunny days a year. With its easy access to some excellent walking trails, Bozen is a great option for those looking for a city break whilst enjoying the benefits of being near the famous Dolomites. 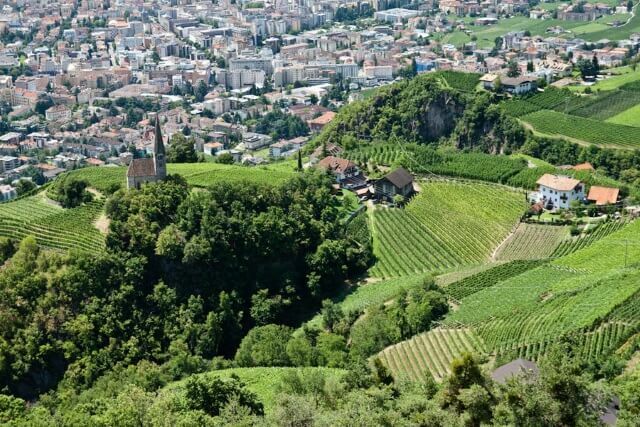 Bozen provides an excellent base from which to explore some of the famous walking routes in the surrounding area. Thanks to the positioning between the craggy Dolomites and the beautiful mountains of South Tyrol, the region offers the best of both worlds for hikers; with dramatic Alpine scenery and a distinctly Mediterranean ambiance of green meadows and woodlands. There are also many vineyards in the area (producing some excellent local wines) and some routes incorporate a visit to some of the wineries, where you can stop to sample some of the local produce. Bozen has plenty to see and do, whatever the weather. The blend of Germanic and Italian gives the city itself a really unique ambiance, where 17th century baroque buildings jostle for space with steep roofed, northern European architecture; and of course, thousands flock to the city each year to visit Ötzi the iceman. This world-famous mummy, discovered in the region and reputed to have lived over 5,000 years ago, now lives in the Museum of Archaeology; and it’s well worth paying a visit to this remarkably well preserved local character! The Museum of Nature also provides a good afternoon’s entertainment, with a ‘virtual flight’ over South Tyrol, live animals and a barrier reef aquarium. Whilst in the city, it’s also advisable to make like a local and enjoy a coffee in the scenic Piazza delle Erbe. Alternatively, venture to the outskirts of the city and take one of the three cable cars up the mountains, or explore some of the local castles, such as the 14th century Castel Roncolo, or the gothic Prosels Castle, which has guided tours available. Summer is a great time to visit the region. The city can get somewhat humid, but the surrounding mountains remain pleasantly cool throughout the year. Spring and Autumn are predictably cooler, but it’s not uncommon to enjoy temperatures between 15˚ to 20˚. In the summer, expect to experience temperatures up to 30˚; however, there is the added advantage that all cable car routes are open at this time. Keen wildlife fans will be pleased to know that there are many eagles in and around the peaks of the Dolomites, and the area is also home to the Roe Deer and Chamois. In the spring, the alpine meadows come alive with a colourful floral display, though the floral blanket of white crocuses in early spring are also very impressive. In summer, the sides of the mountains become covered with red rhododendron and elsewhere, you can see spectacular displays of auricula, gentian and lily in bloom. There are two international airports near Bozen; Innsbruck in the north and Verona in the south (both approximately 2 hours by train or car). Alternatively, you can get to Bozen by train, or travel by car. However, you may prefer to leave your car at the Fair on the outskirts of the city, and then catch a bus into Bolzano itself. Buses depart on average every 15 minutes throughout the day. Alternatively, you can catch the train, which depart every 30 minutes.